Your guests will love the Magic Mirror experience, with colorful animations and voice prompts your guests will be entertained like a VIP. The Mirror is also interactive, guests can sign on the mirror, engage in a screaming contest, and even send the photograph via text to there phone. Most importantly, they will take home a keepsake image from your event. Kids of all ages will enjoy the interactive experience the Magic Mirror furnishes. We also offer props suitable for all ages making the experience even more memorable. Before there were cell phones you had to walk into a photo booth to get a keepsake photo. Today we blend some of the latest touch screen technology to provide a nostalgic experience using the latest digital technology. Want your guests talking about how much fun your reception was? 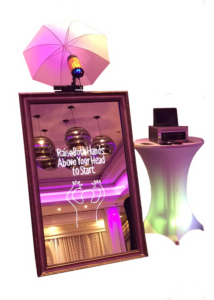 The Magic Mirror will have your guests raving for weeks afterwards. With the mirrors texting feature, you will be all over social media that evening with likes, tweets, and re tweets galore. Why give a traditional box of almonds when you could have a fun photo from the day that guests can look back on for years to come? One idea is to give your guests an empty photo frame with a note to go to the photo booth later that evening. The magic mirror attendant can print an extra one to put into the frame to take home. Today’s photo booths boast the highest quality pictures and technology and the Magic Mirror is no exception. We furnish our Mirror with a DSLR camera, professional strobe and diffuser. We make sure that your prints are the very highest quality. Are you having a theme for your wedding day? 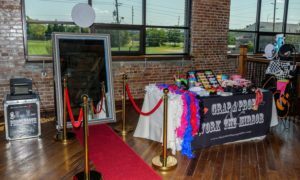 We can brand the mirror to match your event. Whether your wedding is in an elegant ballroom, rustic barn, or at the beach, we can decorate the mirror to match your event. We also customize the photo overlays, and welcome screen to make your brand stand out.